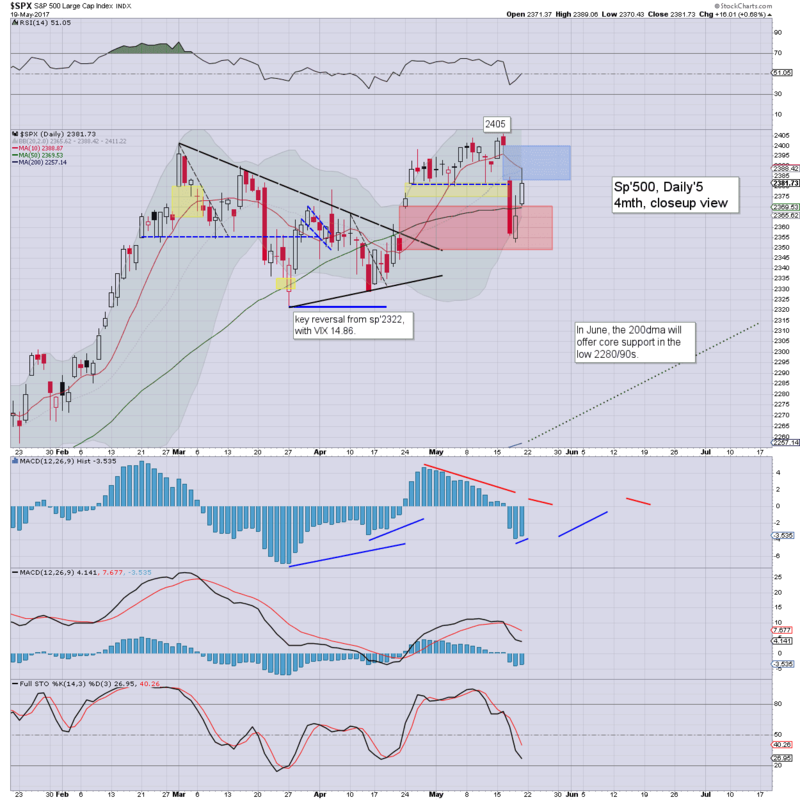 It was a bearish week for US equity indexes, with net weekly declines ranging from -1.3% (Transports), -0.6% (Nasdaq comp'), -0.4% (sp'500, Dow), to -0.1% (NYSE comp'). The mid term outlook remains broadly bullish though, as the US market is still regularly breaking new historic highs. 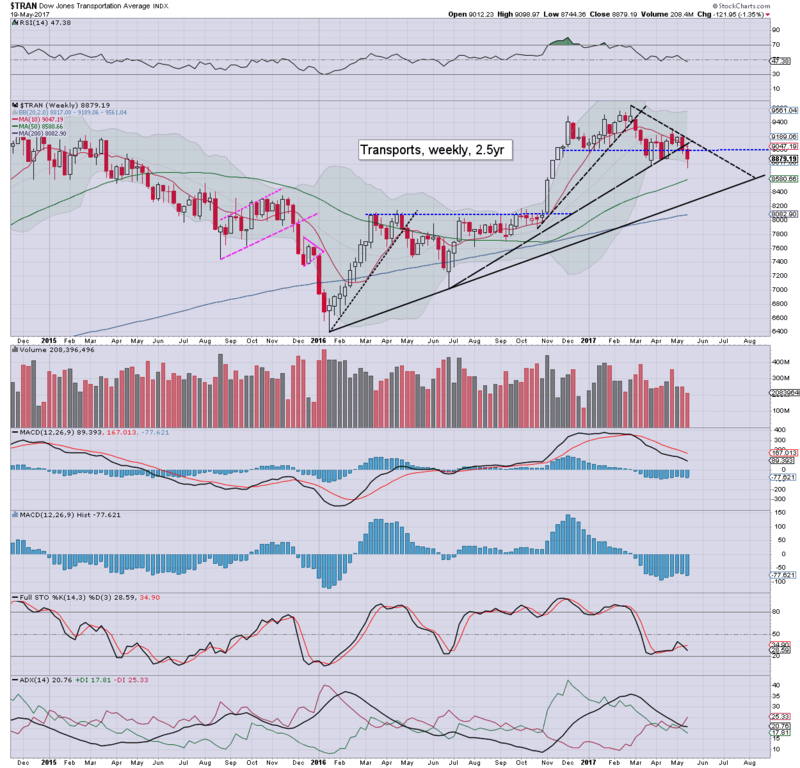 A net weekly decline of -9pts (0.4%), settling at 2381. 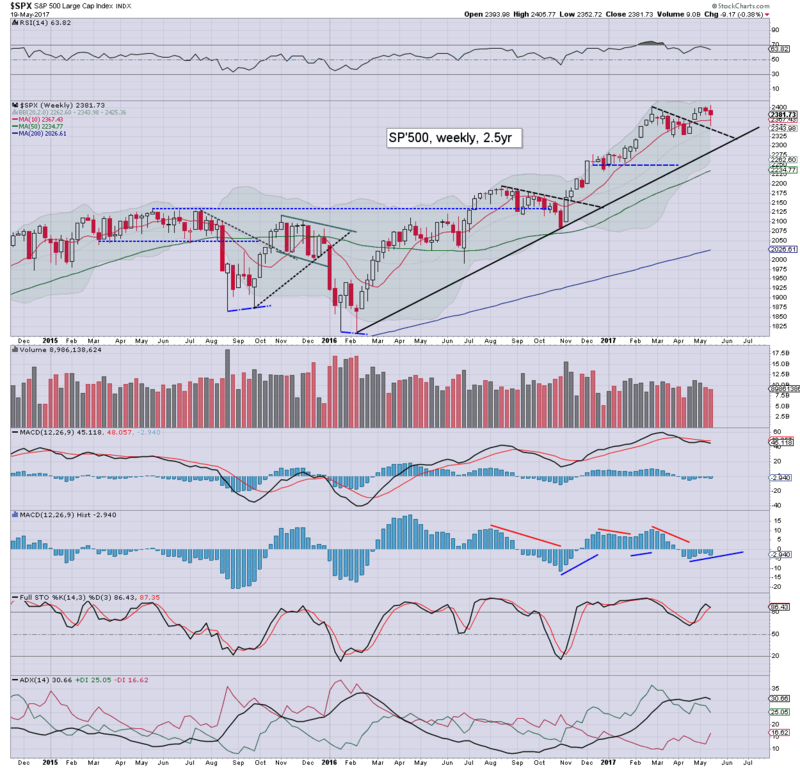 However, the week did begin on a positive note, with a new historic high of 2405.77. Underlying MACD (blue bar histogram) remains negative, as price momentum is leaning to the bears. Best guess: another brief washout to fully fill the gap zone of 2348 - before Memorial day, and then leaning back upward into end May. If the fed raise rates in June (or July), the market should be able to continue broadly climbing. 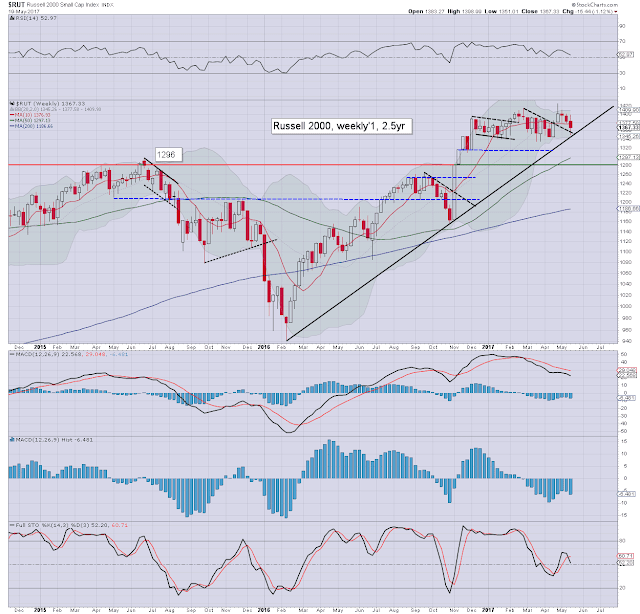 The 2500s seem a realistic target by late September, when a moderate 5% retrace is just about viable. The year end target of 2683 remains on track. Equity bears have nothing to tout unless a break of the mid term rising trend. That will be in the 2290s next week, and in the 2350s by late July. The Nasdaq started the week on a positive note, with a new historic high of 6170, but then swinging to an early Thursday low of 5996, settling net lower by -0.6% at 6083. There remains a notable unfilled gap at 5910. Underlying MACD has a divergent cycle high relative to the Feb' peak. There is a threat of a bearish cross before end month. Things would turn bearish with any closes <5900. Rising trend from summer 2016 will be around 5800 as at end May. The mighty Dow declined for a second consecutive week, settling -0.4% at 20804. Its notable that we've not traded under 20k since late January. 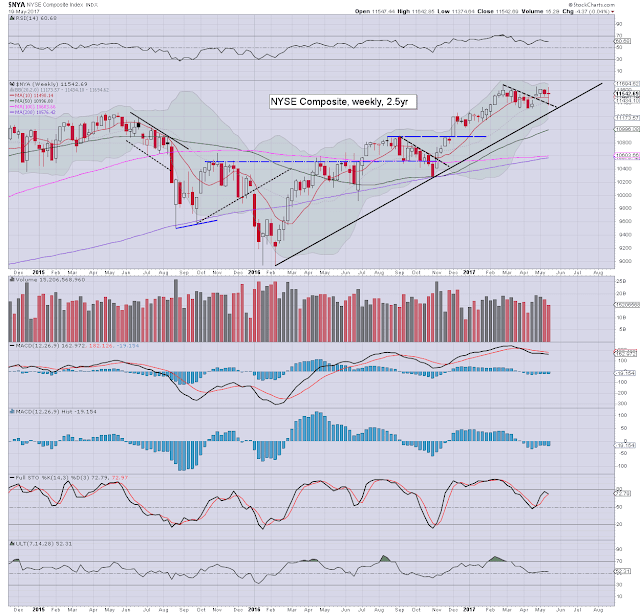 Indeed, first big support is the 20k threshold, and that does look secure for the mid term. 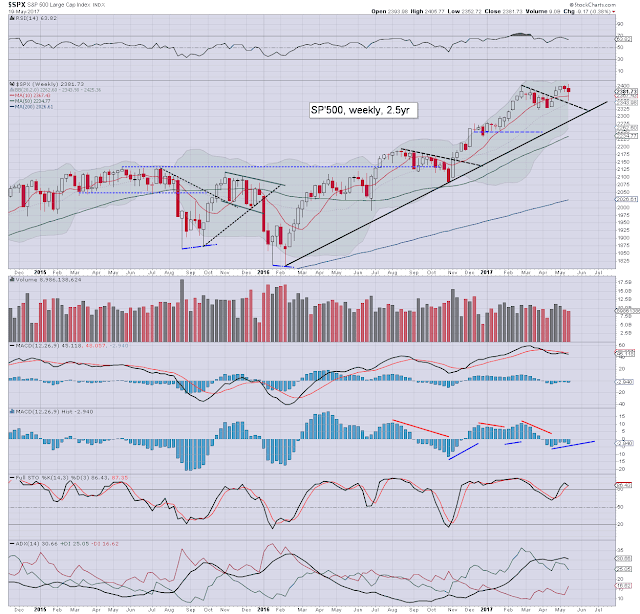 Any price action under 20k from June onward would merit alarm bells. The master index settled -0.1% at 11542, having also filled the big price gap from April 24th. Renewed weakness to the 11300/200s seems probable, before another swing upward into June, and across the summer. Things would turn very bearish with any price action <11200. 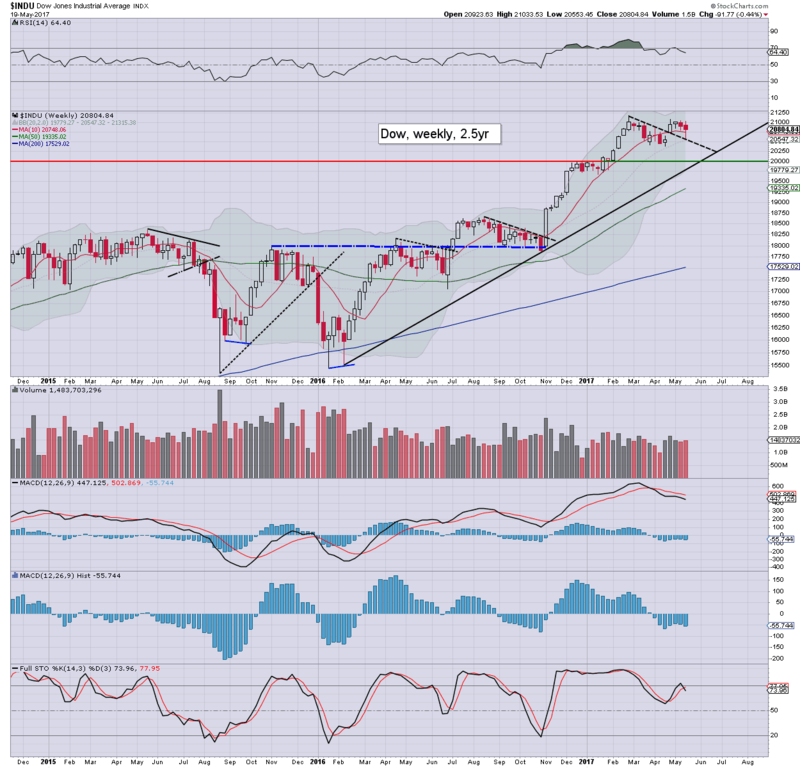 The second market leader - R2K, settled lower for a third consecutive week, -1.1% at 1367 (intra low 1351). Underlying MACD remains negative. Things would turn provisionally bearish <1315. Alarm bells would need to sound on any daily/weekly closes <1280. The 'old leader' - Transports, remains the market laggard, with a net decline of -1.3%, settling at 8879. The weekly close <9k is rather bearish, and is supportive of the notion that the US market will see another sig' wave lower before memorial day (May 29th). Next support is the 8600/300 zone. Alarm bells would need to sound on a break <8k, but that is another 10% lower. All US equity indexes are holding their mid term upward trends from early 2016. The Nasdaq remains the market leader, with the Transports still lagging. Most indexes have around 4% of downside buffer before the mid term trends are challenged. 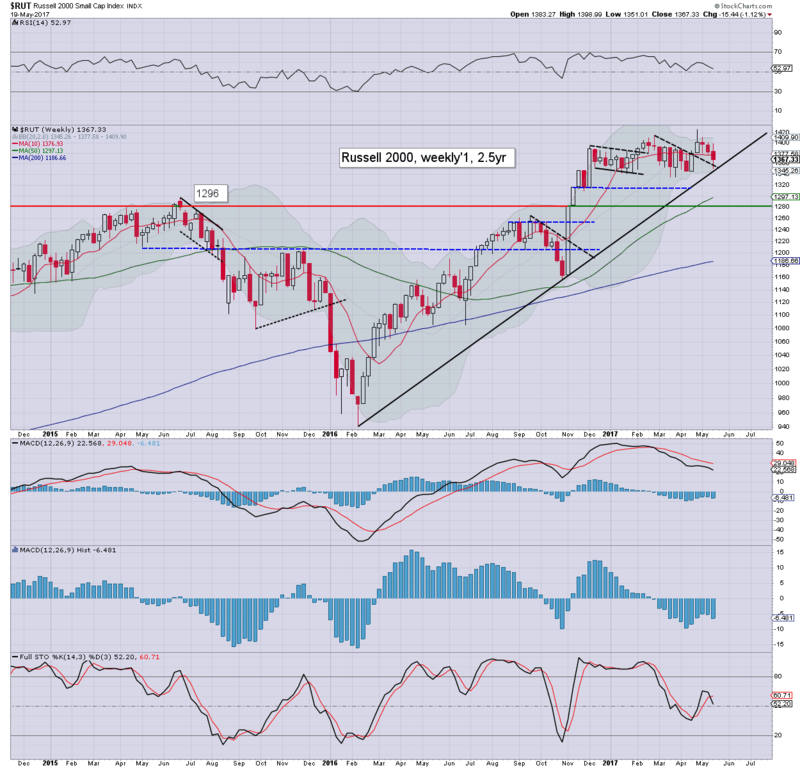 Equity bears have nothing to tout unless a break of the mid term trends, with a monthly close under the 10MA, which for the sp'500, is currently in the 2260s. 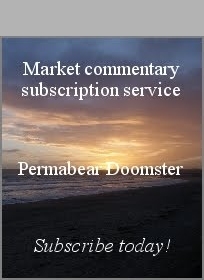 *Monday May 29th, the US market will be CLOSED, and thus the Friday May 26th session will be inclined to be very subdued once the econ-data is out of the way by 10am. **there are a great many fed officials on the loose next week. Mr Market will be listening for any sign of dithering about a June rate hike, which would be a prime excuse for another wave lower. The next post on this page will appear Monday at 7pm EST. US equity indexes closed moderately higher, sp +16pts at 2381 (intra high 2389). The two leaders - Trans/R2K, settled higher by 0.7% and 0.4% respectively. VIX settled -17.9% at 12.04. 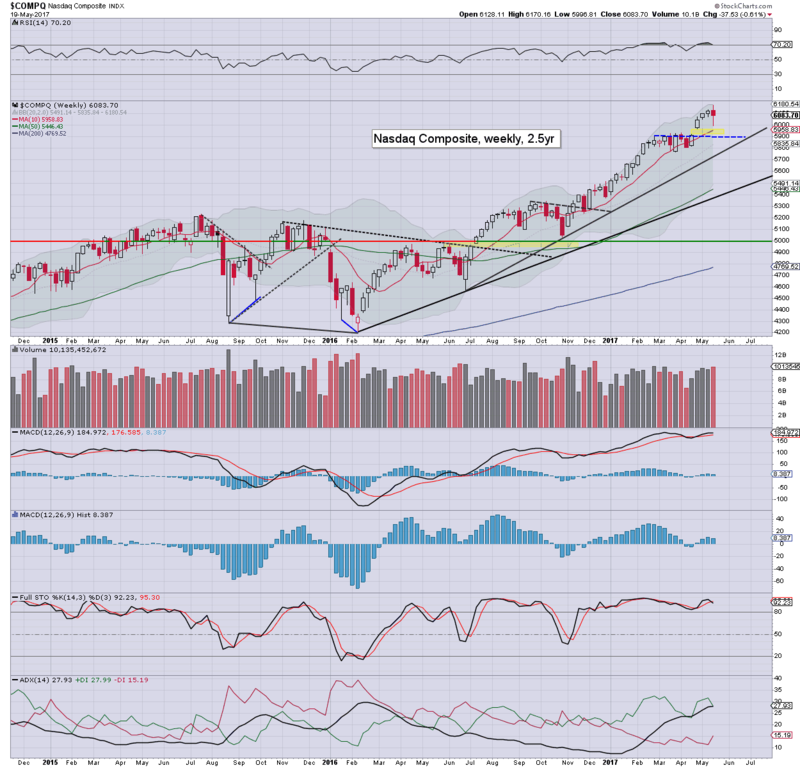 Near term outlook threatens gap fills to sp'2348 and Nasdaq comp' 5910, within 2-4 days. The upward swing from the Thursday low of sp'2352 continued, with borderline significant gains to sp'2389. There was some late day cooling, which does offer a hint of another big wave lower next week. 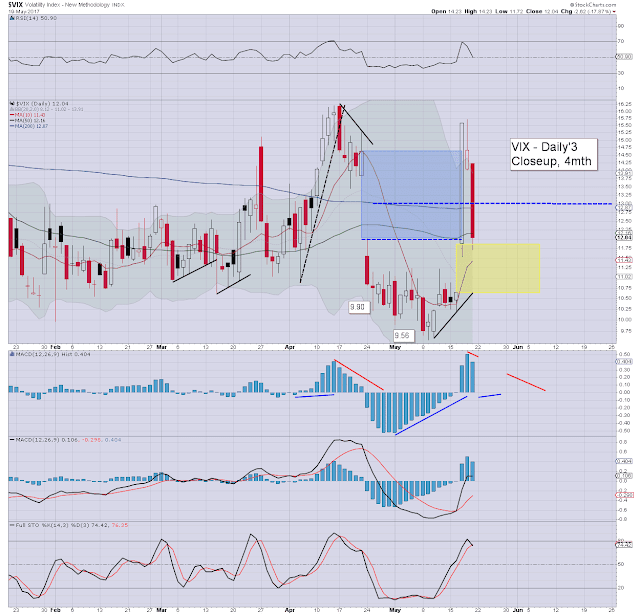 Volatility was crushed, with the VIX seeing a low of 11.72, but notably settling back in the 12s. Even if sp'2348 next week, VIX shouldn't be able to claw any higher than the mid teens. On Wednesday, the cheerleaders of clown finance TV were visibly spooked. Today's push into the sp'2380s saw a swing back in mood to 'everything is fine' again. Its truly incredible how bi-polar the mainstream have become. If we're not breaking a new historic in at least one index each day, they are twitchy. A mere 1-2% decline, and they are indeed... frankly, all on suicide watch. My 'best case' outlook is for sp'3K in 2018, and then a natural bear market (with a cyclical recession) to the sp'1600/1500s. If correct, how are the cheerleaders going to cope with that? 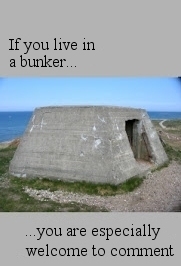 Will they all need to put in a safe space or something? 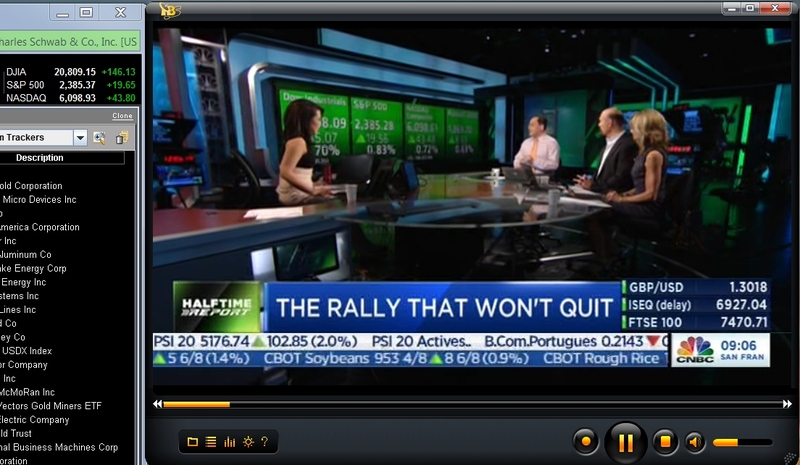 I dream of Cramer appearing in 2019... touting 'take the money out, that you might need for the next five years'... when we're trading somewhere around sp'1600. In Cramer's defence, that was from Oct'2008, and the market did indeed plunge a further huge amount into March'09. The point is, if we do ever trade down to the sp'1600/1500s again, I'd imagine many - even the cheerleaders, might start to become resigned to a deflationary collapse. However, it remains my view that the central banks simply won't permit it. The fed will buy student debt, infrastructure bonds (you know they are coming, right? ), and of course, we're yet to experience outright 'helicopter drops' to the unwashed masses.